You are here: Home / Ed Tech / Curricular-Materials / Top Hat Marketplace: What is it and should we care? When Top Hat announced their latest round of financing a year ago ($22.5m), I admit to having been skeptical, or more accurately cynical, about their stated purpose. The company was primarily known for its mobile and laptop-based classroom response system, but now it is claiming to be a digital content company. Top Hat is one of a handful of startups trying to find ways to disrupt the traditional textbook publishing industry, dominated by companies like Pearson, Cengage Learning Inc. and McGraw-Hill Education Inc., which is owned by Apollo Global Management LLC. All of these firms have added digital educational materials to their range of products, but the transition has been rocky. Then in the summer the company announced their new Marketplace. The Top Hat Marketplace answers the urgent need of professors and instructors to easily find and create educational content that is interactive, easily customizable and much more affordable for students than conventional textbooks. The educational content in the Top Hat Marketplace breaks the slow-paced publishing model by allowing educators to provide one another instant feedback. This collaborative community-sourced model means that the Marketplace’s content is continually being updated and improved upon. We at e-Literate have been covering the long-running and messy transition to digital curricular materials, including the search for new business models for content companies. But the announcements from Top Hat, to me at least, had the feel of a company pivot leveraging big, bad publishers as the bait for naive investors. Quite often it feels like the official greeting of ed tech entrepreneurs has either been "we're going to beat Pearson" or "we're going to beat Blackboard". Top Hat and its products do not neatly fit into typical categories, but this may mean that we're seeing a new model emerge, or at least a modernized and serious attempt to establish the self-publishing model. As we've already discussed, 90% of the content in the Top Hat Marketplace is free for instructors and students to use. However, by the end of January, students no longer need to use the Top Hat engagement app to access this content—meaning, students will no longer need to pay the per-term app fee to use free textbooks and content. “We leveraged our existing relationship with educators already using our classroom engagement tools to test and launch the Marketplace,” said Mike Silagadze, co-Founder and CEO of Top Hat. “The Marketplace finally puts educators — the people at the forefront of learning — in charge of their course materials. 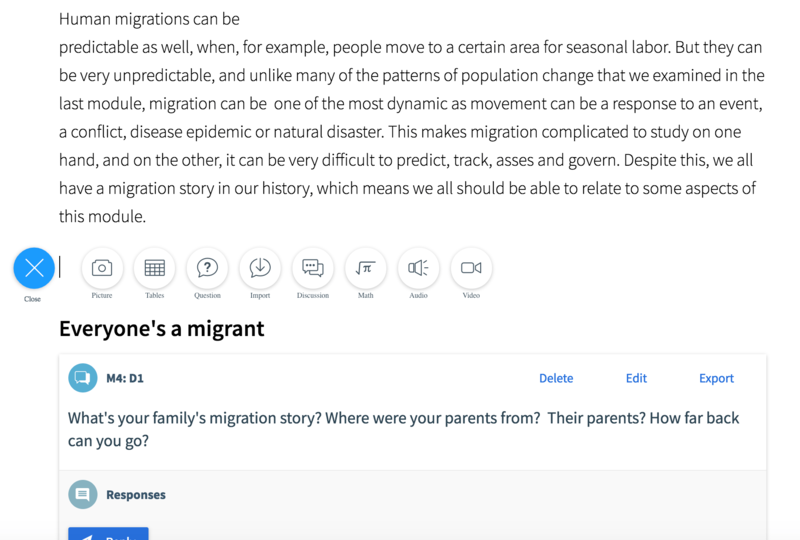 The Marketplace has been designed as a self-publishing platform for educators designed around collaboration tools called Textbook. I interviewed Demian Hommel, senior instructor of geography at Oregon State University, and his experience helps explain the path that Top Hat is taking from classroom response systems to content marketplace. Hommel is an "an advocate for place-based and experiential education, service learning, and research-informed teaching" and has used the classroom response system for several terms. In the meantime, he has wanted to create a geography textbook but did not want to go through the traditional publishers. Since he already knew of Top Hat, when they announced Textbook and the Marketplace Hommel decided that he wanted to go with the self-publishing route. Hommel's interest in publishing models does not seem to be driven by financial considerations, at least for himself, as he said he is not sure how well Top Hat will be able to scale usage of the Marketplace. One big driver for self-publishing was the interest in keeping the textbook current in a changing world of geography. Hommel views the Marketplace as providing a convenient platform enabling active learning techniques and the ability to control and update his textbook over time. There is another differentiator in how Top Hat provides content - the remarkably easy method to enable instructors to modify content, whether in the authoring process or as customizations to content that instructors choose to adopt. Basically, if you can author a post in Medium, you could create and modify content in the Top Hat platform. This is the same interface as originally used to author the textbook. Beyond the ease of editing (customizing for my class, adding my content) is the apparent ease of accepting updates from the content author, based on a new feature introduced in a limited trial in September. The instructor sees a notification about updated content, reviews the updates, and (if all works out) decides whether to update while maintaining any customizations made by instructor. The functionality also promises to allow an instructor to review and adopt customizations made by others who are working on the same base content. This is not an easy problem to solve, but if Top Hat is able to resolve how to deal with conflicting updates and local customizations, the intuitive user experience could change how faculty members and course designers collaborate and update content. Top Hat does have some real challenges in establishing themselves as a full-fledged content provider. One was mentioned by Hommel, when he pointed out the lack of broad awareness of the Marketplace amongst faculty even at his university. Top Hat is known for its classroom response and presentation systems, and with the Marketplace acting as a two-sided market, it needs sufficient supply of self-publishing content and sufficient numbers of adopting instructors. CEO Mike Silagadze response when I asked him about the adoption challenge is that the Classroom adoption, which they claim to be used "at 75% of North America's leading colleges and universities and reaches millions of students", has established Top Hat's direct relationship with thousands of faculty members. In this way, they are betting that Demian Hommel is a model - aware of company through Classroom, interested in textbook usage based on self-publishing model, and willing to extend their personal usage of the company's products. One other challenge is that it is not a done deal that self-publishing has sufficient demand on the content creation side. Are there enough instructors in a broad array of disciplines who want to invest the time and effort to create textbooks without a clear model of possible financial reward? This is the bet that Top Hat is making, that the market can grow to the point that there are reasonable clear answers on financial rewards. And there is the hope that there are enough Demian Hommels who are willing to make these commitments without financial drivers. I do not know if this product will take off, but if it does the Marketplace would establish a viable self-publishing model for faculty willing to work within the Top Hat platform. Over the past year in particular, the landscape of digital curricular materials is adding new models, and the Marketplace is worth watching. There is also an OER angle based on Top Hat's marketing and the OpenStax partnership, which I'll describe further in another post. Update 1/8: Corrected timing on change to student access and fees. Hello, I’m making a text in TopHat now but have not been a Classroom user. Initially I thought I could include all the discussions and assignments within the interactive text; it would essentially double as an LMS. But as I test the tools using a student account, I’m getting a feel for some of the limitations. For example, the Discussion is not threaded and will probably only work for very brief responses. Hyperlinking is awkward. And students can’t put images in their answers. Basically I am realizing I will still need to use other platforms (in my case, Blackboard) for the more substantial assignments in the class. Has that been your experience? Hi dochoekstra, I have not created a text – just reporting on it and not fully qualified to answer. I have not heard (yet?) that Classroom should be thought of as complete LMS replacement, however. Put another way, I’d be very interested to hear any answers from people creating content and using in classroom.